We're passionate about vintage fashion. Our dynamic sales team is made up of vintage-lovers that are skilled at trend-forecasting, styling and merchandising, each working together to curate relevant seasonal collections from our 100,000+ piece archive. and scan table upon table of flea market wares. We do the digging for you, customizing our cases with only the best pieces that fit your needs. Collections are shown at major industry markets in New York , Paris, London and Los Angeles, but our specialty is creating personal capsule collections tailored to each unique customer's vision. Creative Director Amy Voloshin founded PF Vintage in 2006 with her husband Leo. 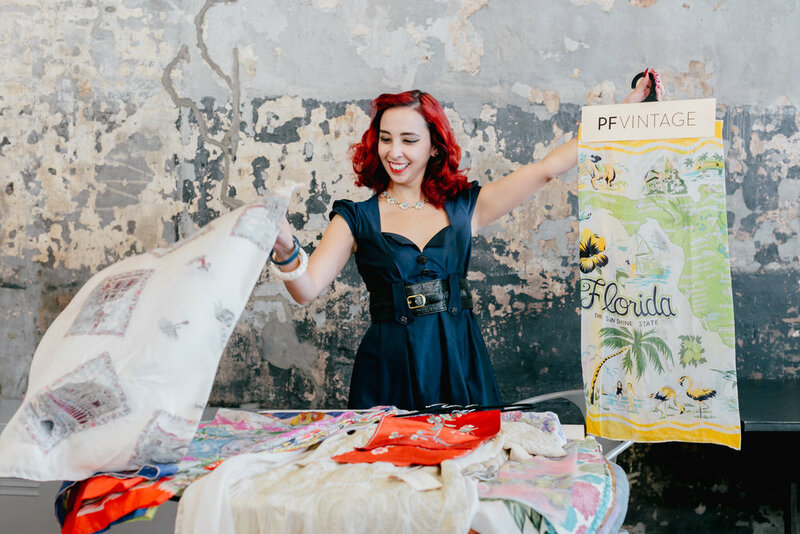 What started as Amy's personal collection of vintage textiles has grown into a massive archive, known worldwide as an inspiration provider for all different types of designers. A graduate of the Rhode Island School of Design and a textile designer, Amy has always loved browsing flea markets and collecting antique clothing and fabrics. She has been featured for her signature style in NYLON, the New York Times Magazine, The Philadelphia Inquirer and Martha Stewart Weddings. Amy and Leo have continued to cultivate their passion for art, design, and providing opportunities for their community - this entrepreneurial spirit has inspired them to embark on a number of other creative ventures. Printfresh Studio is a textile design studio that specializes in original prints and graphics for the Womens, Juniors and Kids markets. Printfresh draws inspiration from both Amy's print design experience and the antique textiles she picks up in her travels - the result is a stylishly boho stationery line. A reflection of Amy's personal aesthetic and desire for comfort and subtle luxury, Voloshin is a new fashion line that features block printed fabrics and soft embroidery.